Let's begin here by looking at a picture of one way qualitative and quantitative data can be linked together. The left column illustrates the flow from 'Fieldwork' to 'Generate New Themes,' summarizes much of what takes place in basic qualitative research. On the other hand, the more logical positivist (or empiricist) rules for quantitative research are more tightly constrained by guidelines for how data are to be collected, hypotheses defined, planned analyses, and results reported. But, if the questions under study can be better represented by both types of data, we need ways to bring them in touch with each other so more complex questions can be considered during analysis. 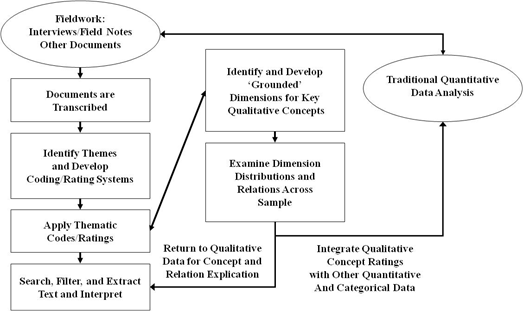 In this exemplar model, ratings or dimensions of qualitative themes are generated, explored, and integrated with other quantitative data. By doing so, they serve as a mechanism for moving back and forth between the two types of data and allow easy access to the best evidence for particular questions - sometimes qualitative, sometimes quantitative, and sometimes both. In Dedoose, these ratings are the codes weights/ratings that Dedoose uses to build visualizations that expose patterns in these complex relationships (Lieber & Weisner, 2010, 'Meeting the practical challenges of mixed methods research.' In A. Tashakkori & C. Teddlie (Eds.) Sage Handbook of Mixed Methods in Social & Behavioral Research, 2nd Edition (pp. 559-579). Thousand Oaks, CA: SAGE Publications). 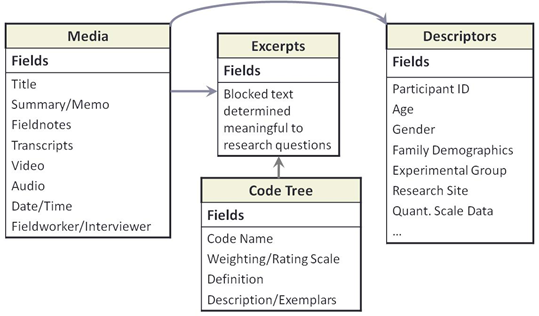 This next figure shows the basic architecture of a Dedoose relational database and how the various aspects of the mixed methods database are connected. Through a set of relationships every piece of information is connected: from media to descriptors, excerpts to media, and codes/tags and tag weights/ratings to excerpts. These relationships allow Dedoose analytic features to use any and every piece of information how the data are displayed, filtered, analyzed, and exported.